Just in case the imminent arrival of iOS 7 isn’t enough to get you pumped, Apple’s also gone ahead and released iTunes 11.1. Less exciting, you might think, but a necessary part of the equation: If you want to sync your device running iOS 7 with your computer, you’re going to need the latest version of Apple’s music-playing-video-watching-podcast-downloading-device-syncing-app-with-large-fries. But that’s not the only new feature in iTunes 11.1. Launching alongside iOS 7, iTunes Radio makes its Mac debut here, accessible via a toolbar option in the Music section. You can browse through Apple’s featured stations or ones that you create yourself (and if you create a station on an iOS 7 device, it’ll automatically show up in iTunes Radio on your Mac, too). As on iTunes 7 you can tweak stations to your tastes, choosing from hits, more obscure songs, or a variety. Buying songs from the iTunes Store is as easy as clicking the price when listed next to the name of the currently playing track. And you can share stations with your friends via email, Messages, Twitter, Facebook, or just by copying a link. Another new feature in iTunes 11.1: Genius Shuffle. This feature—accessible from the Controls menu, by pressing Option-Space, or by holding down the Option key and clicking on the new Genius Shuffle icon in the toolbar—automatically creates a mix of related songs from your library that iTunes thinks you will enjoy; think of it as a random Genius Mix. Click Genius Shuffle again to hear a totally new set of tunes. 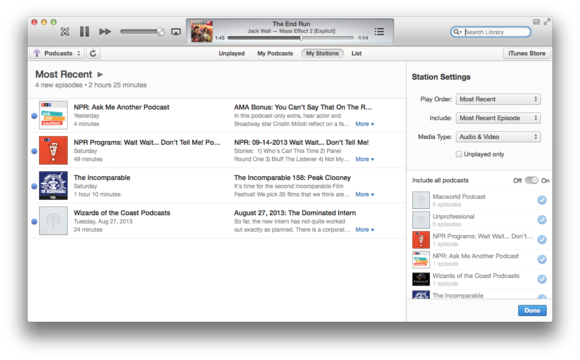 The new My Stations feature lets you queue up a playlists of podcasts the way you want to hear tme. Podcast fans will welcome some additional improvements in iTunes 11.1: You now have the option to keep your subscription synced between all your devices (on iOS, they’ll sync with the Podcasts app). There’s also a more prominent button to refresh and check for new episodes. And newest of all is a My Stations feature, which lets you create a playlist of podcasts to listen to: You get to pick what episodes and in what order they “air.” Even better, those stations and your current playback location sync via iCloud to the Podcasts app, so you can pick up your listening when you’re on the go. iTunes 11.1 is available now from Apple’s site and should appear shortly in the Mac App Store’s Updates pane. iTunes Radio is currently only available to users in the U.S.